Freelance writing is like entrepreneurship. You can’t instantly get into it just because you think you can make it your bread and butter. Here are some insights on how you can earn a decent or comfortable living as a freelance writer. 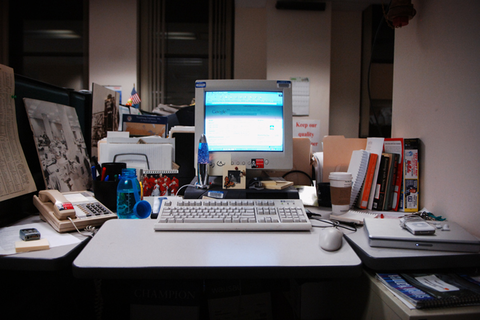 Many have tried freelance writing, only to leave because their earnings were not enough. Can you make a living as a freelance writer? The answer is a big YES. Here’s how. Write something that you know and are passionate about. This way, it is easy to mold and improve your writing skills to become an expert on a certain topic. Do you have a background on finance, medicine or technology? Clients want “expert” writers and with your industry knowledge, you can get ahead of competition although technically you are just starting out. Seasoned freelancers avoid bidding sites like Odesk.com and Elance.com due to low rates but these are great sites for aspiring freelance writers to test the waters. Writing jobs found on these sites may have lower rates but the demand is high—perfect for new writers. Just skip those $1-per-article postings. For print publications, “What is most important is that the topic you want to write about is current, of interest to a wide audience and has an angle unique enough to snag an editor’s attention,” says Palanca awardee Yvette Tan who writes fiction and also contributes to various print publications and online sites. 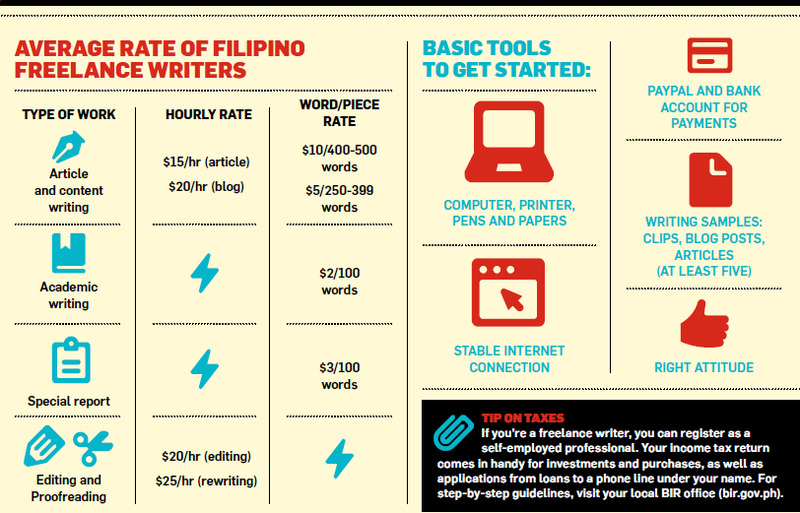 For high-paying writing jobs, Imee Morales, founder of Freelance Writers’ Guild of the Philippines, suggests targeting corporations (local and foreign), advertising agencies, some NGOs, and institutions. Rate is a tough question in freelancing and there is no such thing as a “magic number.” Your experience, the time and effort needed to write the article, as well as how your article will be used, determine the rate. “It should be the amount that will make you work with a smile on your face,” says Morales. 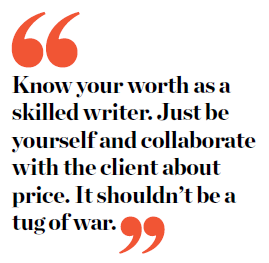 Given her nine years of experience, Roque only writes for clients willing to pay at least $75 for a 500-word article. Companies that sell a product or service know that a well-written article is a good lead-generating strategy to attract customers and will not hesitate to pay higher, she points out. Many Filipino freelancers do not ask for downpayments just to get and keep clients, but it should and always be a must: 50 percent upfront payment or in increments throughout the project, not just to safeguard you from scammers, but also to increase your reliability and trust factor. Be yourself and be firm. Negotiate. “Always have a monthly goal in terms of income and make sure you are working on a money-making project everyday,” advises Morales. If your target is to earn P30,000 each month, work towards this mark. Eliminate distractions and have a routine for focused work. Do not be afraid to diversify to reach your target income. From working online, mix it with print contributions. Supplement your income by writing and selling e-books or write articles covering different niches. Experienced freelancers like Roque and Barrios limit working with two to three clients at a time. Be honest with clients; give them a target date when you can start working with them. Having many clients doesn’t equate to high earnings. Successful freelancers are those who have long-term relationships with clients. Editors give more assignments to writers they can rely on; repeat clients as well as referrals ensure steady work. Avoid disputes with clients by discussing your project thoroughly beforehand, maintaining professionalism. Be upfront with the issue and end a client relationship if necessary as a mature professional. No Twitter ranting or writing a flaming post on your blog that would only discourage clients. This story was originally published in the October 2013 issue of Entrepreneur magazine. Subscribe to the print or digital version of the magazine here .